Need help moving as well as storing? Look no further, MY STORAGE Self Storage offers assistance via reputable movers. 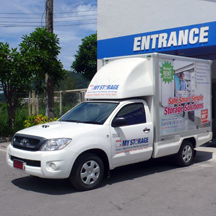 MY STORAGE Self Storage offers customers a convenient moving assistance at the time of move-in and move-out by recommending reputable movers. You can select to fully use their services including providing the packaging material, labor to pack and to let them load and unload your belongings or purchase packaging material, then pack and load the belongings yourself. Please contact MY STORAGE if you need assistance arranging these services. Types and sizes of Moving Trucks. Reputable movers offer various types and sizes of vehicles from small open pick-ups to large covered 6 wheel trucks. Contact MY STORAGE Customer Service Representative at phone number 076 29 29 09. They will assist you in determining the correct size storage unit for your belongings. Once you have selected a size, we recommend that you reserve the unit and schedule a convenient time to visit the store for a tour of the property. While you are at the store, you can also fill out all of the necessary paperwork, make your payment and schedule the truck and driver to meet you at your home or business. What if I don’t have time to visit the facility before I need to move-in? Not a problem, contact MY STORAGE Customer Service Representative on above number. They will assist you in determining the correct size storage unit for your belongings. Once you have decided on a size, inform the representative that you will not be able to make it to the facility prior to the truck pick-up. The representative will fax and/or email you a New Customer Information Form to fill out and fax or email back. After receiving the form the representative will provide you with information regarding the payment and schedule a time for the truck and driver to visit your home. What if I’m not packed when the truck and driver arrive? It is your responsibility to make sure that you are ready to load your belongings by the date and time you scheduled for the truck and driver. If you have not finished packing your belongings, then you can load the belongings you have ready. You will be responsible for transporting the remaining unpacked belongings to the storage unit at a later date. Please contact MY STORAGE Self Storage for further information, terms and conditions apply.